NASCAR is debuting a new set of rule changes in to two of its minor league series this year, and they’re set to put on the kind of cheesy manufactured action that makes daytime soaps look unscripted in comparison. The Xfinity Series stock car championship and the Camping World Truck Series are the latest victims of NASCAR’s meddling, with both series getting their own versions of the Chase playoff-style championship, just like the top-tier Sprint Cup. Worse yet, a new low in racing fakery will be reached in the Camping World Truck Series, which gets a “caution clock” to interrupt the action regardless of what’s happening in the race. The introduction of the Chase in the lower series has been rumored for several months now. However, after this year’s Chase for the Sprint Cup made headlines for all the wrong reasons, I was hoping this announcement was the result of a slow news day at The Onion, or perhaps a little-known Carolinian version of April Fool’s Day. Nope! Never mind that “behavioral penalty” brouhaha from the Sprint Cup! More versions of the Chase are really happening, with some bonus questionable ideas thrown in for fun. Why is NASCAR making all of these changes? Given that the NASCAR press release announcing the new Chases touts the fact that the 2015 Sprint Cup finale saw “the highest...viewership in nearly a decade, record-breaking page views on NASCAR.com and unparalleled volume on social media,” it’s not hard to figure out. Fans, partners and the industry have embraced the new Chase format like nothing we’ve seen in the sport’s history. Winning never has been this important, and the excitement generated the past two seasons in the Sprint Cup Series has led to this implementation of the Chase format in all three national series. Competition in both the NASCAR XFINITY Series and NASCAR Camping World Truck Series will undoubtedly elevate to new heights and shine a spotlight on the rising stars of our sport. Problem is, some of France’s claims, such as the importance of wins, are laughably debatable. The driver with the most wins does not automatically win the top-tier Sprint Cup’s convoluted championship. Excitement was generated by the Chase, but it was over playoff-related drama that egged several drivers into facepalm-worthy incidents. Drivers throwing punches over stressful win-or-else Chase situations get attention, sure, but in the same way a toddler throwing a tantrum does. It reinforces every negative view the naysayers have of the sport. Let’s not forget the Sprint Cup season finale, either. It was fantastic, but the four who made it in almost felt more like carefully curated picks by NASCAR management than the four best drivers of the season. Sure, they all won their way in fair and square, but to say that it’s the Chase that drove eyes to the finale would be short-changing beloved driver Jeff Gordon’s final race, or Kyle Busch’s fantastic comeback drives leading into the finale. Of course Homestead-Miami was fantastic to watch, but there were plenty of reasons to tune in besides the Chase’s effect on motorsports’ most gimmicky championship. With all of that in mind, here’s a quick run-through of the changes coming to NASCAR’s second- and third-tier series next year. Brian France and I agree on one thing: it’s a good thing for NASCAR to have some consistency across all of its championships. If the main show utilizes one system to determine a championship, then the feeder series for it need to have a similar system in place as well. That way, folks can get used to it as they move up. Unfortunately, the Chase is simply a garbage way of picking a champion. Sure, you have to be consistent to make it through to the end, and winning in one round automatically advances you to the next round, but otherwise, it’s all manufactured drama in a series that doesn’t really need it. NASCAR already produces close racing and fantastic on-track battles. The cars are evenly matched and the drivers are immensely talented, especially at the front of the pack. There’s no need to drag the top end of the field to their wits’ end and implement complicated playoffs to determine a champion. Look at all of the criticism of this year’s Chase for the Sprint Cup, for France’s sake. While Kyle Busch certainly did the best at playing NASCAR’s Chase for the season title, many fans were unamused that a man who missed eleven races ended up winning the Sprint Cup. Anyone who felt as if the series’ highest annual award was supposed to be the culmination of a season of on-track achievement was left screaming in all-caps on the Internet that night. Joey Logano actually had the most Sprint Cup wins last season, but he was eliminated before the final round of the Chase and ultimately finished sixth for the season, thanks for NASCAR’s confusing elimination-based system of points resets. Sure, not every series championship goes to the driver who wins the most, but for all the Chase’s proponents’ claims that the Chase encourages drivers to be consistent—I don’t buy it. There’s a significant amount of luck needed to win the Chase, even more so than in more conventional championships. Is this a racing championship or a gambling tournament? Xfinity Series and Camping World Truck Series fans, you get to find out! According to today’s NASCAR press release, all NASCAR drivers will have to pick one championship to earn season points. Sprint Cup regulars can still come run in their support series and give the up-and-coming drivers some stiff competition, but they can’t vie for the Xfinity or Camping World Truck championships. 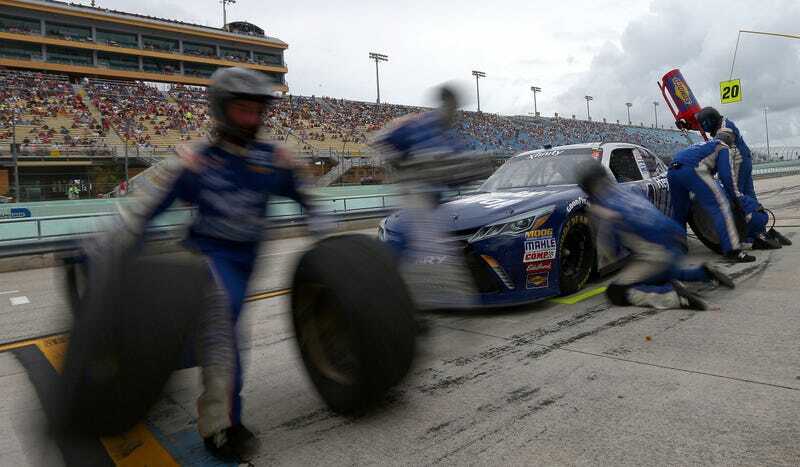 Per Fox Sports, drivers from other series cannot compete in the Homestead finales, either. The Xfinity Series and Camping World Truck Series will now both feature seven-race, three-round playoffs. The final four drivers from both series will compete in their respective season finales at Homestead-Miami Speedway, just like in the Sprint Cup. As with the Sprint Cup, the lower-level series’ versions of the Chase are maddeningly complicated. Drivers qualify for the Xfinity Chase based on the first 26 races for the season, and a win automatically qualifies a driver for the Chase, so long as they finish in the top 30 in points and attempted to qualify for every race. Likewise, winning during a round of the Chase also automatically advances you to the next round. Kentucky Speedway will host the first Chase race of the Xfinity season on Sept. 24, featuring 12 of the series’ top drivers. Like in the Sprint Cup, points are reset after every round of the Chase to put all of the competitors on an even playing field. Three additional points for each race won in the first 26 races are added to each Chase driver’s total at the start of the first Round of 12. After three races, the Chase field is cut to eight drivers based on wins or points, and then the field is whittled down to a final four after a second round of three more races. The highest finishing driver of the “Championship 4" is the series champion. The NCWTS Chase operates with as much mind-melting complexity as Xfinity’s: win in the first sixteen races before the Chase kicks in and you’re in, so long as you’re in the top 30 in points and have attempted to qualify for all of the regular season races. Win during a round of the Chase and you automatically advance to the next race, with the remaining contenders in each round being determined by points. Even fewer drivers compete in the NCWTS Chase, though. The first round consists of eight of the season’s most winning and highest scoring drivers. The initial Round of 8 kicks off at New Hampshire, followed by two more races before the field is cut to six drivers. Like in Xfinity, points are reset for each round of the Chase, with three bonus points given for regular season wins at the start of the Round of 8. After the second Round of 6, the field is narrowed down to its Championship 4, who compete in the season finale. The highest finishing driver there wins the season championship. The NASCAR Camping World Truck Series gets the most ridiculous addition in all of motor racing: a caution clock! The only thing I’ve ever heard of that would be anywhere near as fabricated as the NCWTS caution clock was Formula One head and Statler-Waldorf hybrid Bernie Ecclestone’s idea of artificially wetting the track surface with sprinklers. While that hasn’t happened (thank goodness), the caution clock is unfortunately coming to NASCAR’s truck series. Here’s how it works. NASCAR wants to artificially bunch up the traffic to increase the action and/or eyeball rolls, so NASCAR is doing what NASCAR usually does: throwing cautions. According to Jayski’s Silly Season Site, if a caution flag hasn’t been thrown for twenty minutes, they’re going to throw another one for no good reason at all other than they can. The caution clock is reset every time a green flag is thrown, however, it won’t be used for the last laps of a race. These innovations contain the elements of racing that our fans want the most. The enhancements put a premium on in-race strategy, and will create an unprecedented level of excitement as teams make tactical decisions that could impact their spot in the Chase. What? There are plenty of racing fans who would debate O’Donnell ad nauseum as to what they want the most in a racing format, and many of those don’t want to see the series interfering with the racing every twenty minutes. Forcing everyone to re-fight for their position every twenty minutes may seem like a simple way to create on-track drama, but it erodes the foundation of the sport and the entire reason why many fans watch to begin with. Why even bother tuning in at all until after the last caution clock if the rest of the field gets the chance to catch up every twenty minutes? Furthermore, flags and restarts are some of the hairiest situations to negotiate for the drivers. Whether you’re slowing down or speeding up, drivers are more likely to crash into each other when there are large differences in speed on track, and when race traffic is less predictable. Much like grown men throwing punches over race cars, big crashes often reinforce NASCAR haters’ low opinion of the sport: that it’s a dangerous, reckless hot mess. Upping the crash factor is not what NASCAR needs to expand its fanbase. NCWTS isn’t a series that needed spicing up with cautions, sprinklers, or hoards of bears released randomly throughout the season to eat the front of the field. The racing is good! The in-race strategy has been fine! Don’t make it stupid. Per NASCAR, the one exception where these cheesy ultra-fake caution flags won’t be thrown is the series’ lone dirt-track race at Eldora Speedway, where the race is broken into three segments already. The lone gimmick announced yesterday that might not be so bad is the addition of heat races to the Dash 4 Cash series. Fans who have followed drivers as they came up through local and regional dirt tracks and ovals are no doubt familiar with the format, where heat races between chunks of the field feed into a main finale. Bringing it up into a higher-level series is an interesting move. Now, NASCAR reports that the Dash 4 Cash events will consist of two heat races and a main race. Odd-numbered qualifiers will compete in one heat, even-numbered qualifiers in the other heat, and the top two finishers in each heat will be eligible for the event’s $100,000 Dash 4 Cash bonus. The two races also determine the 40-car starting order for the main. I keep waiting for a punch line to that caution clock announcement, or at least something obviously fake to give it away. Are all the drivers required to get on grid via silly walks? Will all eligible races be in the Toyota Yaris? Is Deez Nuts the race steward? Although I think the Chase is a shameless play to manufacture drama, I can at least applaud the move towards being consistent from series to series. Heat races in Xfinity should be fun, and making the Dash 4 Cash matter in the season results is a good idea. Unfortunately, the fact that NASCAR moved the idea heat races up from lower-level series proves that they’re not afraid to move more questionable innovations up the oval-racing food chain, too. After all, their response to the Chase last year being a controversial mess was to institute the Chase in other series. If “NASCAR should be consistent” ever applies to the caution clock, I don’t think my face can withstand that many palms. Interrupting the racing action for a fake yellow flag is already a solid contender for Worst Idea of 2016. NASCAR may win more eyeballs on the sport with these changes, but for all the wrong reasons. If you want to see the worst ideas in motorsport at work, tune in to NASCAR’s b-leagues.